Empowering Flint residents to decide and guide their community’s response to the water crisis is critical to supporting resiliency and ensuring the beleaguered city heals from both historical and recent trauma, a key leader in the city’s recovery efforts told a School of Social Work audience on Nov. 9. 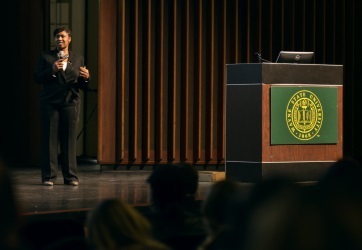 Returning frequently to the theme of self-determination – a core tenet of both the social work and public health professions – social epidemiologist Vicki Johnson-Lawrence delivered the school’s 30th Annual Edith Harris Lecture at Wayne State’s Community Arts Auditorium, describing how the water crisis both resulted from and contributed to chronic stress and disparities afflicting the city. She said pre-existing conditions – including unemployment, violence, poverty, inadequate schooling and housing, limited community-wide trust, competitive rather than collaborative community relationships, and emergency manager control – created a climate for the policy decisions that introduced lead to the water and stymied efforts by advocacy groups and community leaders to achieve a collective, cohesive response. Community-based participatory research – in which the people being helped by external experts contribute their experiences and knowledge to all aspects of identifying and solving their own problems – has been extremely important to Flint’s recovery, noted Johnson-Lawrence, who directs the Flint Resiliency in Communities After Stress and Trauma (ReCAST) program. Funded by the Substance Abuse and Mental Health Services Administration, ReCAST harnesses the strengths at the intersection of social work and public health, combining both a clinical focus on the health effects resulting from the lead poisoning with a sensitivity to social conditions, life stages, family systems, and social justice concerns that impact recovery. ReCAST’s promotes trauma-informed, evidence-based approaches to improve overall public health, well-being and resiliency in the city. “I don’t know anyone in Flint who wants ‘recovery’ to mean going back to the way things were when the water crisis began,” noted Johnson-Lawrence. Praising Flint as a “model city” in terms of its ability to adapt, Johnson-Lawrence stated residents want recovery to mean not just obtaining safe water once again, but solving the “package of problems” that have caused the social and economic renewal benefiting much of Michigan to elude them. During his introductory remarks at the lecture, Social Work Interim Dean Jerrold Brandell described the ways that School of Social Work faculty, staff and students have assisted Flint in the aftermath of the crisis through material aid, direct practice, research, and the evaluation of public health and policy responses. As part of the Wayne State-led Flint Area Community Health and Environment Partnership, Social Work researchers have worked to assess the behavioral health needs of Flint residents and connect them with available resources. The Policy to Action initiative established by the school has helped students forge community partnerships, engage residents, lobby in Lansing, and raise awareness of water-related social justice issues via campus-based forums and in-class presentations. Meanwhile, the School of Social Work this year announced the creation of a joint Master of Social Work (M.S.W.) and Master of Public Health (M.P.H.) degree to help meet the rising workforce demand for practitioners with competencies in both disciplines. The program, which began admitting students in fall 2017, promotes the community-based participatory research described by Johnson-Lawrence during her presentation.